If you have a dog to surrender here is this link for contact info. Please do not call to inquire about the availability of Swissies or the adoption process. Instead read our FAQs http://gsmdrescue.org/faqs.php and if you have any questions after that, send an e-mail at the address listed above. 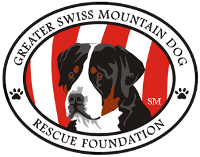 Content © Greater Swiss Mountain Dog Rescue Foundation (GSMDRF) 2009-Present. Use of the GSMDRF logo or any content on this website is prohibited without the written consent of the GSMDRF.